Most baseball teams don’t aspire to be the bad guys, the team that everyone loves to hate. For years the New York Yankees have held that position in baseball, no matter the makeup of the roster. A week before this series against the Chicago White Sox, the Kansas City Royals were busy making enemies with the Oakland A’s(and vice versa) and the Royals were starting to get the image of a team of hot-heads. Then a series with Minnesota calmed the team down, getting back into the swing of things and extracting revenge on the Twins by beating them. So the last thing really expected by venturing to Chicago is to once again have our baseball inundated with boxing. Yet here we are, with more suspensions and fines to discuss after what was supposed to be a 4 game set in the “Windy City”. So what about the play on the field? Glad you asked. Here is a deeper look into how the Royals lost the series against the White Sox, with a little bit of help from Mother Nature. I think I agree with Denny Matthews’ commentary during that inning where he stated that the degree of difficulty on that catch was greater than the Derek Jeter catch where he runs into the stands and comes out bloody. Jeter caught his ball then couldn’t stop his momentum into the stands. 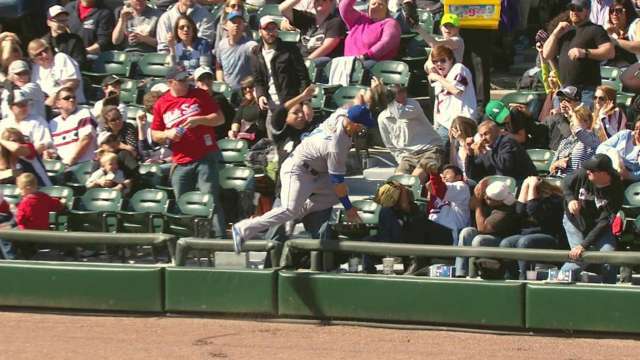 Gordon caught the ball while he was diving into the stands, focusing on the ball and stands at the same time. Either way that was an amazing catch and it would probably come as a shock that it would be the beginning of an inning where the White Sox would score 5 runs(which it was). A great series for Alex and hopefully the beginning of a hot streak for him. Again??? Can’t We Just All Get Along? So what set Eaton off? No clue, although there was later mention of him not taking kindly to Ventura ‘quick pitching’ him. If that is so, then Eaton is way out of line. A quick pitch is just a part of the game and if the White Sox feel like that is some kind of ‘unwritten rule’ in baseball then they have proven my point that most of baseball’s unwritten rules are dumb and taking out of context. 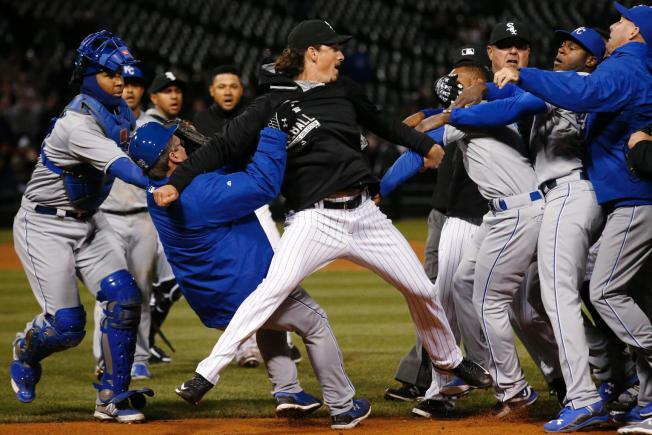 Whatever the reason, the Royals were in their second major scuffle in less than a week and when the suspensions were handed out over the weekend it appeared that MLB offices did not take kindly to the Royals coming across like the modern day version of the NWO. Ventura got 7 games, Volquez got 5 while Cain and Kelvin Herrera(who I still can’t find anywhere in the rumble) got 2 games. I was a bit shocked that Samardzija got only 5 games for the White Sox, as he seemed to be more the aggressor than anyone else. I was thinking he was more likely to get 10 games, honestly. But the message sent by the Commissioner’s office was plain and simple; knock this crap off or we will continue to punish you and your team. I think the bigger issue is that cooler heads need to prevail. It seemed a bit like Eaton was goading Ventura, and if that is so he needs to ignore it. 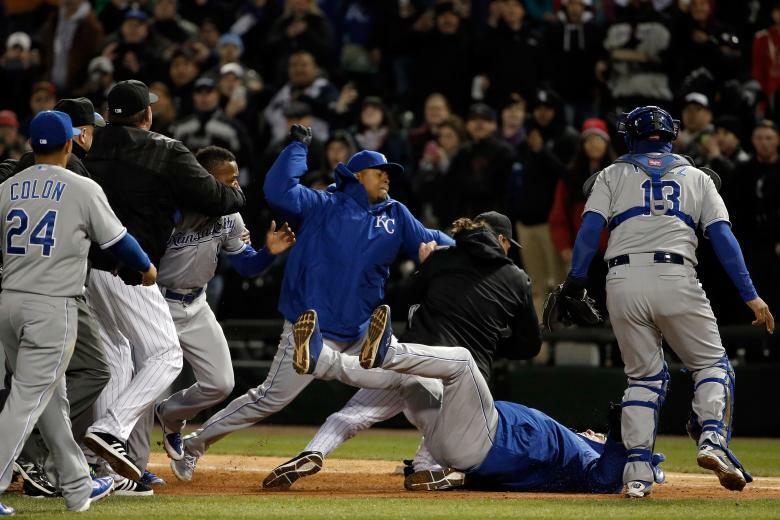 Teams have figured out now that the Royals have a chip on their shoulder and it isn’t hard to get under their skin. Problem is, once these players start serving their suspensions(and Volquez is serving his right now) that will be time that the Royals don’t have them on the field, which hurts the team. More than anything else this needs to stop for the sake of keeping the main components of this team on the field. It might not always be easy, but it is time for the Royals to turn the other cheek. What is most impressive to me that a few guys seem to getting their feet underneath them, like Ryan Madson and Franklin Morales. Madson seems to be looking like his old, pre-injury self(which could be important later in the summer) and Morales has being throwing gas, showing he is more than just a LOOGY for this team. All this and Greg Holland has been out for over a week now and Luke Hochevar has yet to appear in a game this year. This could be interesting to follow all year, as in just how good this Royals bullpen can be. I’m a bit surprised that 8 innings of Friday’s night game got played. By the 7th inning that field was a mess and in all honesty those players should have been pulled off the field. It made no sense to me, since they could make the rest of the game up over the weekend or the 2 other trips the Royals will make to Chicago this season. This only normally happens when a team is making only 1 trip to that city, which wasn’t the case here. Both teams were lucky that no one came down with a serious injury. Speaking of weather issues, Mother Nature continued to wreck havoc, postponing Saturday’s game and making this 4 game series a 3 game series. The game will be made up in July. Yesterday's #Royals White Sox game, which was rained out, will be made up on July 17 as part of a split doubleheader. Paulo Orlando continues to hit. He went 3 for 3 in Friday nights game and is hitting .289 so far this season. 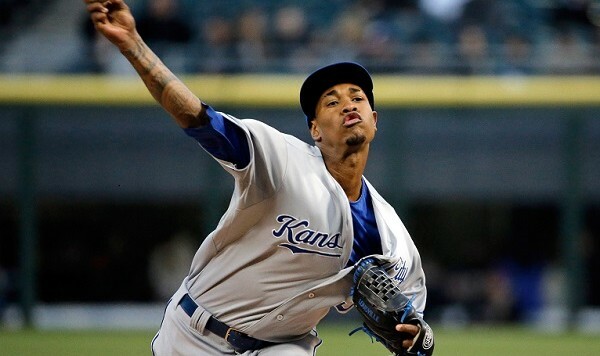 With Alex Rios still out with an injury, it has made manager Ned Yost’s job harder, as he now has to choose from day to day who plays in right field, as Jarrod Dyson deserves playing time as well. Trust me, this is a nice problem to have. 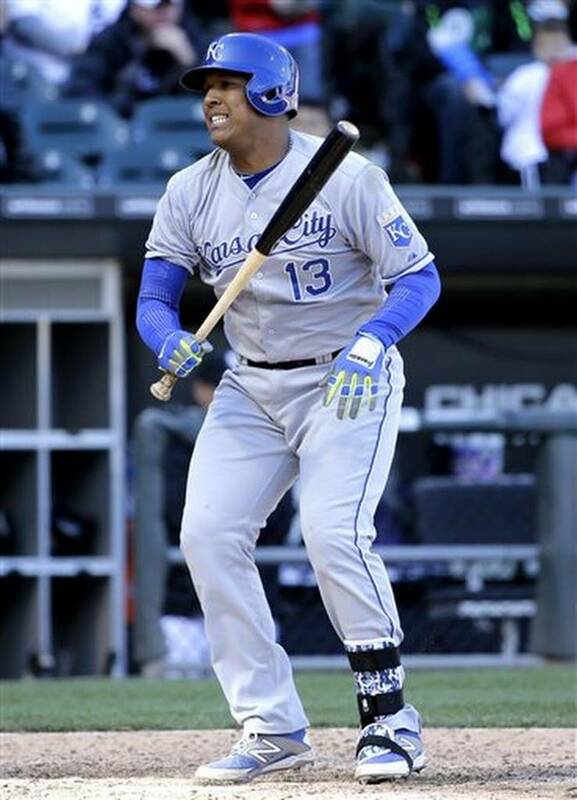 So the Royals lost their second series of the season and now sit at 12-6. 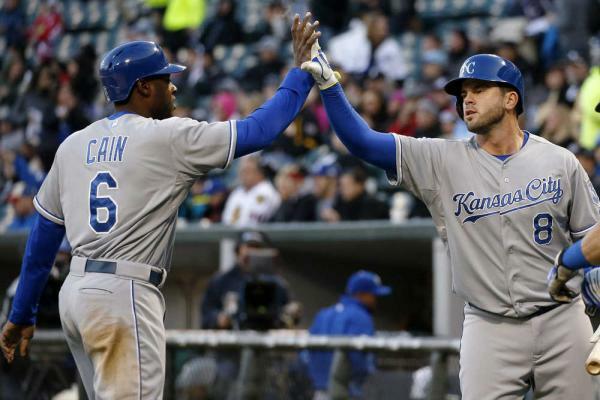 Kansas City will continue to play within their division, as they have the Indians up next for 3 then the Tigers roll into Kauffman Stadium for a 4 game set starting Thursday. A win of both series’ would go a long way to building up a lead at the top of the division for the boys in blue. Hopefully by next Monday we are looking at a first place team who slayed both Central Division foes. I’ve said it before but man, this division is going to be fun this year. This is just the beginning of a four team race that could go down to the wire.